I’ve had a few hours to digest this one and honestly I’m not quite sure what to tell you about it. 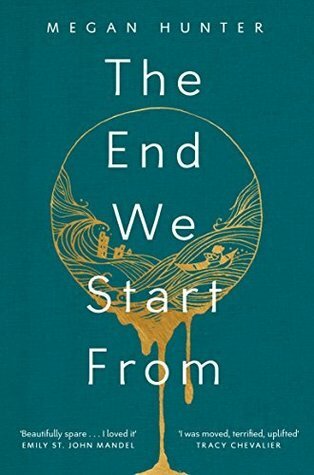 At 160 pages, “The End We Start From” is a very short, almost novella-like dystopian novel told in quiet, sparse paragraphs. In the beginning (or is it the end?) of this very short novel, an unnamed young mother’s water breaks and she gives birth to a son, Z. The water levels around London are rising and Britain is mostly under water. The narrator and her husband, R, move from their home to stay with his parents in the mountains until food becomes scarce there and then they move again, this time to a makeshift camp with other disaster refugees. Baby Z grows, and the narrator’s husband R eventually leaves the family at the camp to investigate other living prospects. During their separation, the narrator continues to observe life around her, make friends, and bond with her baby, Z.
I think I like the concept of this book more than its actual execution. There’s a lot of interesting things juxtaposed here that I could go on and on about: birth, death, the deterioration of civilized society, the creation of new life. There’s also references to the book of Genesis all throughout which fit quite nicely with those ideas. I just don’t care too much for the writing style, it was too sparse for me. The sense of detachment here was also a problem; the constant use of characters’ initials instead of their names made it hard to remember who was who and vexed me to no end. Too much was left unsaid, I wanted more. Despite my misgivings, I’m not sorry I read this book. There’s a very unique narration style here that definitely bears notice and may tickle the fancy of others. 3 stars for me, but I invite others to make their own judgment call.